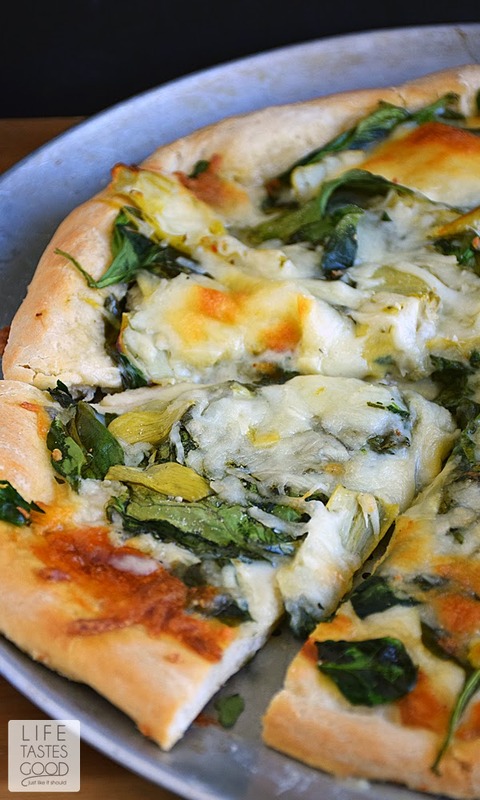 Spinach Artichoke Pizza is like eating one of your favorite dip recipes in pizza form! 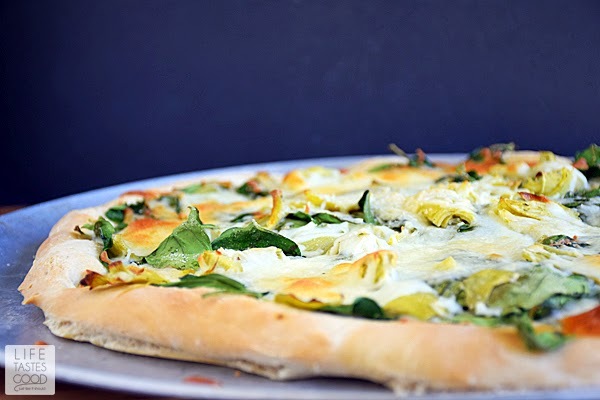 The crust is smothered in an easy-to-make, creamy white Gruyere cheese sauce and then topped with fresh spinach, marinated artichoke hearts, and even more cheese. This pizza smells so good while baking and tastes even better! The absolute best recipes are those that are near and dear to your heart. It might be a recipe that has been passed down generations such as our family Macaroni Salad, or a recipe that holds special meaning because it always brought the family together, such as our homemade pizza! 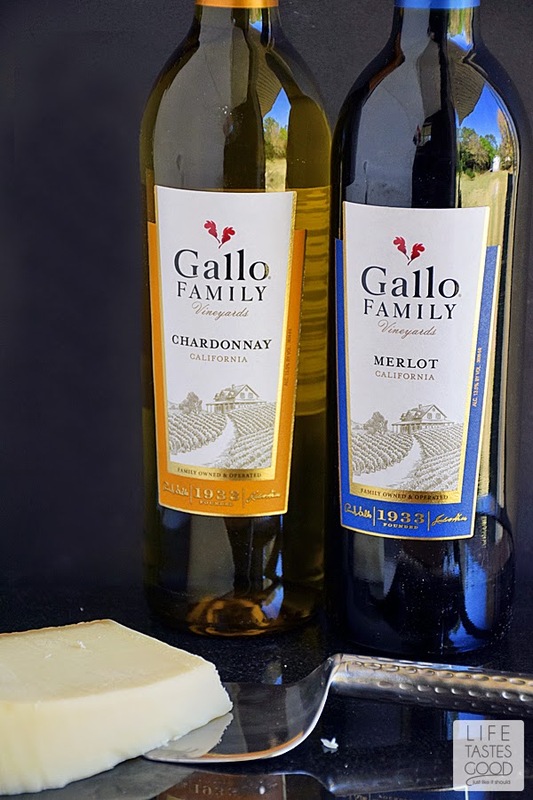 This week our #SundaySupper family has teamed up with Gallo Family Vineyards to bring you our very favorite Meals with Meaning. Be sure to visit each one of them for some tasty inspiration! We love homemade pizza! Not only do we love eating it, but we love making it too! When Madison was little, we always had a pizza night where we would make homemade crust and we would experiment with different toppings. It's fun to come up with new combinations, but white pizza is our all-time family fave! 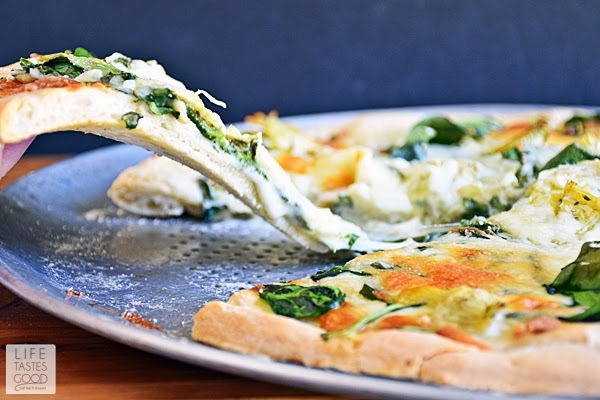 Madison has been making a white pizza for sometime where she uses a garlic and olive oil base on the crust and then tops that with fresh sauteed spinach and mozzarella cheese. She has a magic touch and makes a mean pizza! That has been our favorite white pizza for years now! I've watched her make it, but I've never quite been able to duplicate it. Top the cheese sauce with Fresh Baby Spinach and marinated artichoke hearts. I know it looks like a LOT of spinach, but don't worry, the spinach will wilt and be just the right amount of topping for this pizza! I promise! 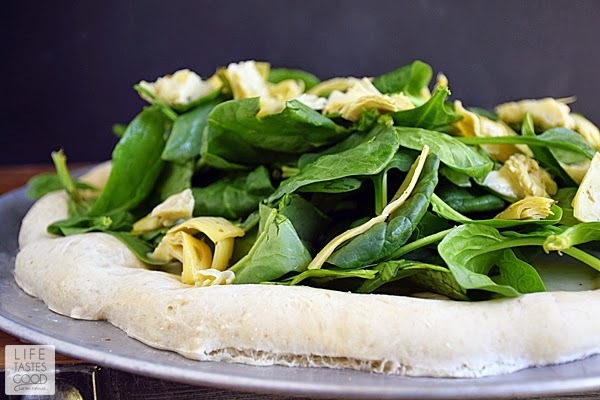 Notice how the spinach wilted and is the perfect amount for this pizza? All there is left to do is pop open a bottle of our favorite wine and enjoy! I am pairing this with Gallo Family Vineyards Chardonnay. I like how this medium bodied wine with rich fruit flavors and a hint of vanilla compliments the cream sauce on this pizza. However, if you prefer a red wine, I recommend the Merlot. Roll out pizza dough to a 16" round and brush with 1 tablespoon of olive oil. Bake in the preheated oven about 10 minutes or until it starts to brown slightly. While the pizza dough is cooking, heat 1/2 of my Bechamel Sauce Recipe in a sauce pan over medium heat. When hot, remove from heat and add 1/2 cup shredded Gruyere cheese. Stir until cheese is melted. Give it a taste and adjust the flavors as needed (psst...guess what you just did? You made Mornay Sauce! Bechamel+cheese=Mornay Sauce). 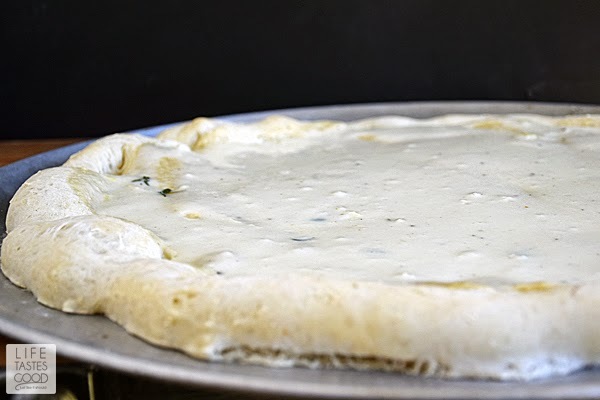 When the pizza dough is just starting to brown, remove it from the oven and top evenly with Mornay Sauce. 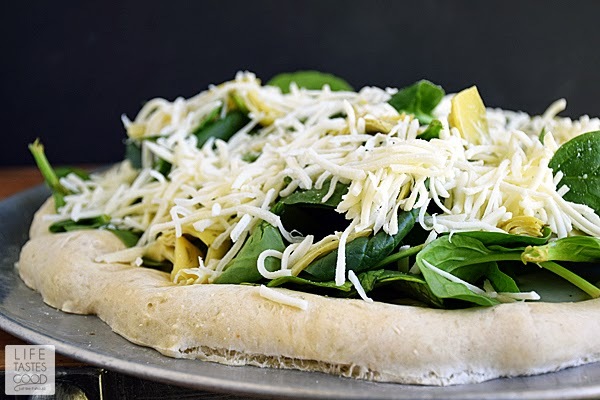 Top the cheese sauce with 6 ounces of fresh baby spinach and 6.5 ounces of the drained and quartered artichoke hearts. Top everything with at least 1 cup shredded Mozzarella cheese and 1/4 cup grated parmesan. Place the pizza in the oven and cook until cheese is nicely melted and a little browned - about 15 minutes. Cook time will vary, so be sure to keep an eye on it and remove it when the crust is baked to your liking. Allow the pizza to rest for about 5 minutes. Slice and enjoy! I love everything about this pizza - everything!!! I think a weekly pizza night is an awesome family tradition! I also love this flavor profile so much, and we need to make it in our home, stat! Oh, this is definitely my kind of pizza! What a phenomenal combination of toppings!!! This pizza... yes! Looks fantastic. Your pizza looks amazing! I love the flavors you have going on! Simply delish! Wow...this pizza is gorgeous! I'll take two slices...and a glass of wine. THIS is my kind of pizza night! I adore this recipe and can't wait to make this!!! Kevin has been asking me to make my homemade pizza again, but I have been dragging my feet. Now that I see yours you can bet I will be making it ASAP!! Since starting our homemade pizza tradition, it is difficult to go out for pizza. We have come to love our homemade so much more! I hope you get a chance to make it, Bobbi! Thanks! This Pizza has my name all over it! YUM! I'm drooling!!!! 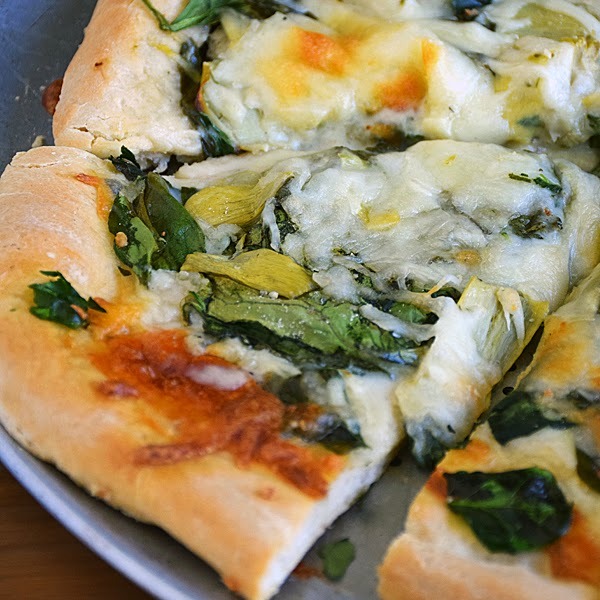 Ah, spinach and artichoke is such a great combo — especially on pizza! I couldn't agree more, Shaina! Thanks! 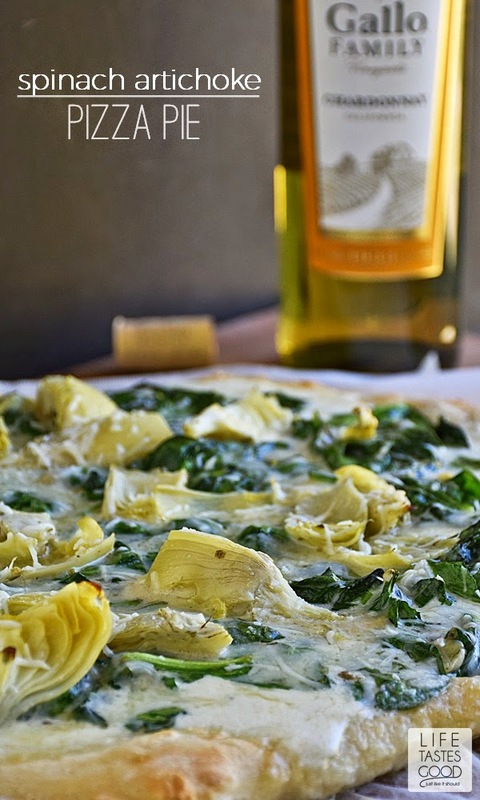 Spinach and Artichoke on pizza, Yes please!! These photos should be in a magazine...absolutely gorgeous of a tasty pizza!